Your data is irreplaceable, so it’s vital to protect it against any conceivable mishap wherever you go. That's why LaCie made the new Rugged tougher than ever. It’s MIL-compliant, which means that data is protected even during accidental drops of up to two meters (6.6 feet). During transit, connect the removable cover to provide IP 54-level protection against dust and water. Whether the LaCie Rugged falls out of your backpack or gets splashed by a mud puddle, you stay confident that your data is still accessible. The hard drive is tough enough to be shipped for reliable delivery to clients or partners. Included software even protects your files from prying eyes with AES 256-bit encryption. 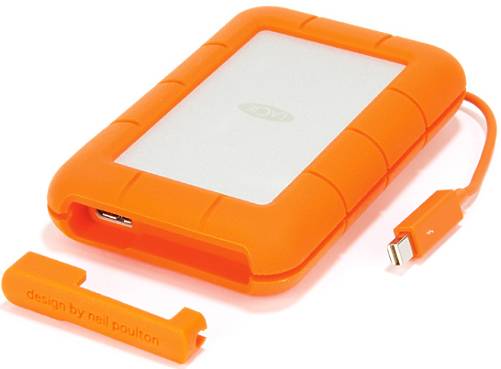 Hire the 2Tb Lacie Rugged USB3 and Thunderbolt from Procam. Best service and rental rates for the 2Tb Lacie Rugged USB3 and Thunderbolt and all cameras, lenses, sound, lighting and grip.